Only six original Shelby Cobra Daytona Coupes were built, making the racecar one of the most coveted vehicles in the world. Worth millions of dollars each, ownership is almost impossible. 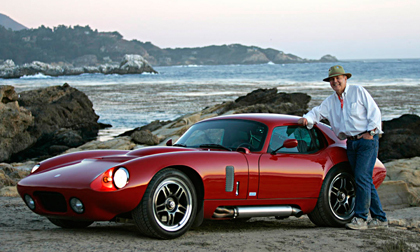 In 1999, Peter Brock had the opportunity to refine the lines of his original design to create the Daytona Cobra Coupe series, which is built by the world’s largest builders of Cobra roadsters, GT40’s and famous 60’s street and racecars, Superformance and Hi-Tech. The new Daytona Coupe is offered minus its engine and running gear for completion by a Shelby Legendary Cars dealer, like BRE. There are several Ford engine options and buyers can choose between a five or six-speed transmission. Air conditioning and other modern amenities round out the car’s evolution.